Turned on my RaspberryPI and gamed RetroPIE with both of my children for two hours today. And I can recommend the controller called "Speedlink Strike NX". It is soooo good. Some time ago, I gave my 486dx33 a different case. And finally I had the chance of updating my blog. brostenen wrote: Turned on my RaspberryPI and gamed RetroPIE with both of my children for two hours today. Thanks for that. Thinking about setting up a retro gaming Pi with something called Lakka. Have you tried this out yet? I tried it on my OrangePI-PC, in 2017 or something. Might have been early 2017 or something. I was not really contempt with it, as it does not appeal to me. RetroPIE are the one that I am sticking to, and I have it set up to use an USB HDD for gamestorage. the_ultra_code wrote: Edit: I forgot to ask. What would you call these type of motherboard standoffs that "clip" into a PC case? I have to replace at least one of them if I intend to "keep" the system. It probably doesn't help but those look *exactly* like the standoffs in Power Computing mac clone towers from the mid 90s. I could use one myself, one was broken in one of my machines. If I find one I'll post the info here (and I'll keep a look out in case one of you finds one). This one rather shocked me today... Loud bang and burned for about 10 seconds....first time I inserted this card. RETROGAMEPC.COM Use coupon code vogons at checkout for 40% discount. 3DMark doesn't give perfectly consistent results, even in direct back-to-back runs. Those are WELL within the margin of error. Diagnosing and repairing a CD-ROM drive that won't eject on command without a CD inserted (ejects with the CD inserted). Finished a project that I started in 2011 (yes, SEVEN years ago!) and now I have a nice and spiffy AT&T PC6300. "It's science. I ain't gotta explain sh*t"
Gotta say, those systems are amazing. Fixed my CR-563-B CD-ROM drive by replacing the eject mechanism motor as that was the root cause (had corrosion and the motor had little resistance left). Now the CD-ROM drive ejects faster than before and I can finally run Yggdrasil Plug-and-Play Linux on my Packard Bell Pack-Mate 28 Plus. 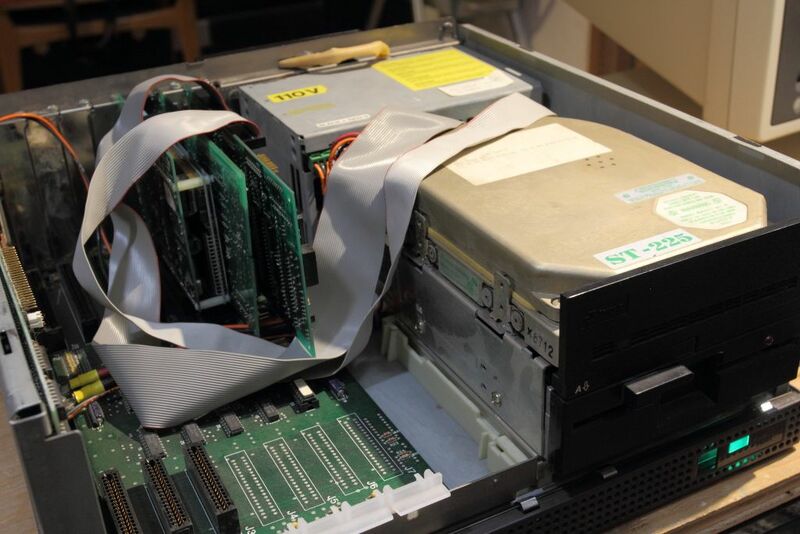 Also dumped the BIOS ROM from my Packard Bell that contains the Micro Firmware (thank you, Roman555 for the BIN file and ahtoh for the suggestion of running the P4HS20 upgrade from the diskette). Attached is the file in case any of you need it for your Packard Bell that has the PB450 motherboard inside (FCC ID: 450-459). The Micro Firmware BIOS supports AMD and Cyrix processors (Voltage Regulators is a must), write-back cache capable (Intel Pentium OverDrive processors will now work without the interposer), more HDD space, more RAM (might be misleading, but, I'll buy the RAM and post on here if it does work), and more items, unlike the original BIOS. I'm really happy to have a CD-ROM drive that is now period correct for my machine, and the only thing that isn't is the 4GB CF Card that I have installed as the hard drive. CelGen wrote: Finished a project that I started in 2011 (yes, SEVEN years ago!) and now I have a nice and spiffy AT&T PC6300. Wow. Love those AT&T systems and yours looks fantastic. Even better is your work space. I spy a Coleco Adam with a NES on top, a Dreamcast, PCjr and an original Xbox sandwiched in between some audio equipment? I think there's a double cassette deck hanging out above. Ha, hidden object game. Wow, this photo is brilliant. 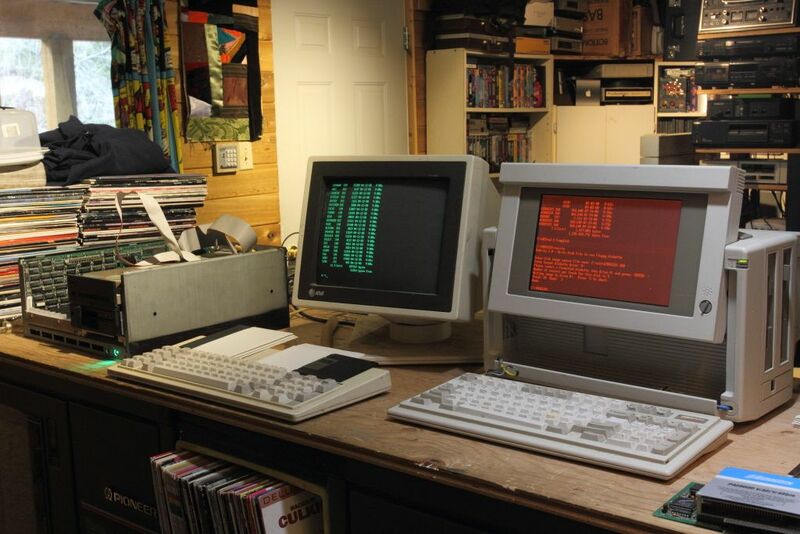 I have a couple luggables with plasma screen, not the one pictured, however. And I adore monochrome machines (Hercules!). But your AT&T (or Olivetti, as it was known in Europe) takes a high place on that list. Lovely, just lovely. 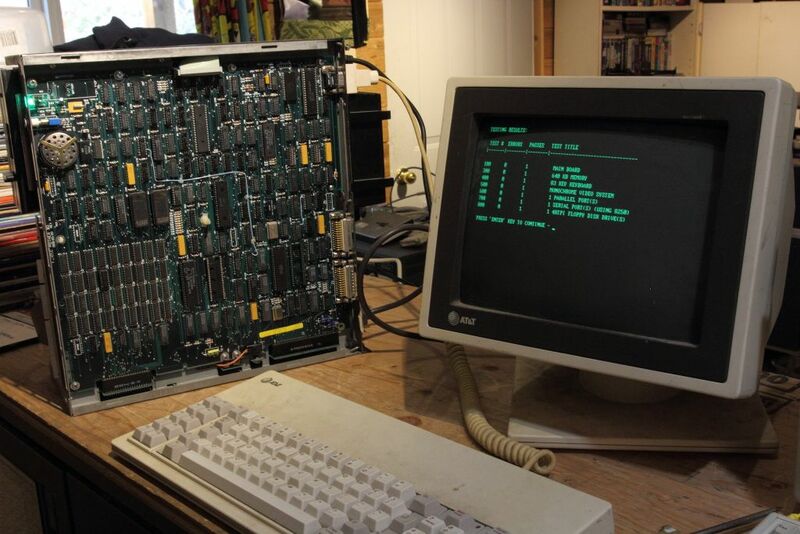 Out of interest: what work did you need to do on the 6300? 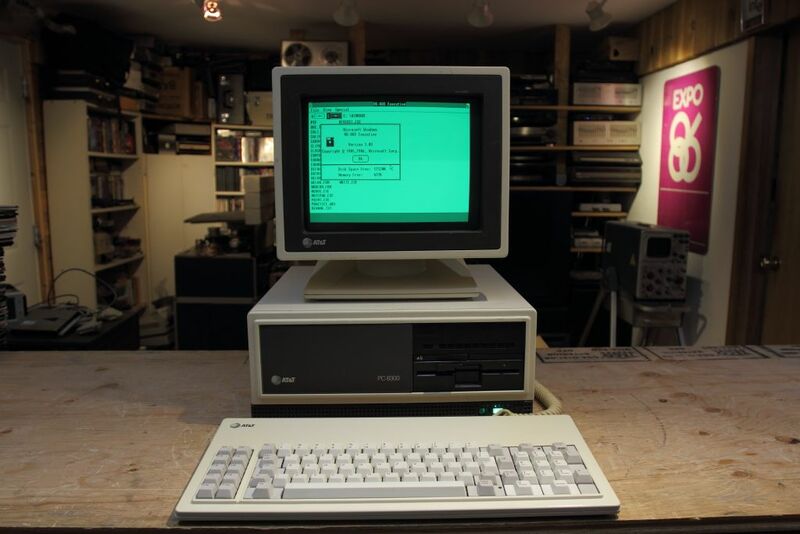 I have two Olivetti M24 systems here, one from 1987 that is fully working, one from 1985 that supposedly isn't. Haven't had time to look at what is wrong yet - I basically only bought it for the keyboard (which was lacking from my 1987 system) and spent my available time cleaning and fixing the filthy keyboard. But I'll get round to the M24 sooner or later. Initially it worked and had a healthy and non-leaking battery in it. Then I put it in storage for three months and when I got back to it the battery was flat and badly leaking. I spent several years on and off verifying traces, replacing components, swapping IC's with a known working machine and probing just about every data line with oscilloscopes and logic analyzers. We assume the leakage wicks into the inner layers and messes up the traces but we don't know exactly which ones fail and it's an extremely common problem with these computers. I finally gave up on it last month. Someone cut me a deal on another board that was untested and I found out it only needed the reset button and power LED changed plus one bad ram chip replaced. It has the latest 1.43 BIOS and PAL's and that seeexy 20mb ST225 which I ran a new LLF and bad block check and is STILL flawless. All I'm missing now is the proprietary mouse that plugs into the keyboard so I don't need to use up an ISA slot or my only serial port. Starting with Windows 1.03 the environment shipped with native support for said mouse and the high resolution video mode. 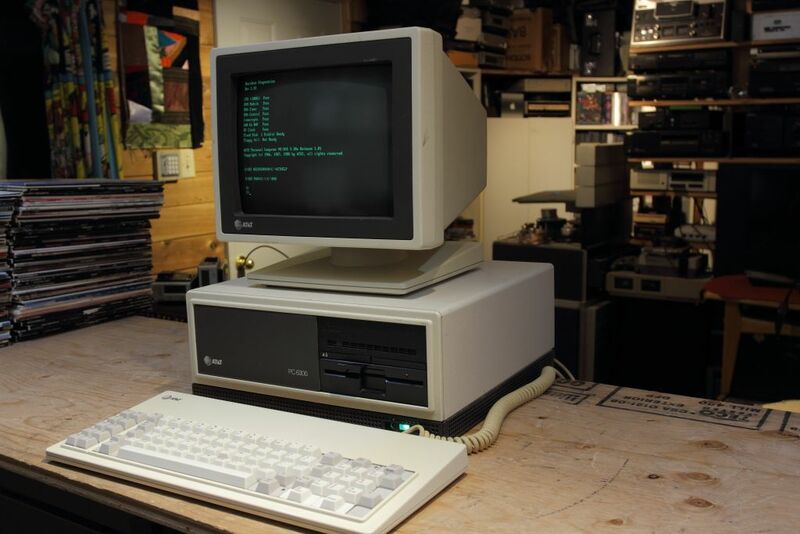 My 1985 model was originally HDD-less, but had a Microscience 20MB drive and HUGE controller card retrofitted sometime later, the 1987 one had a factory-fitted NEC 20MB drive. Of course I have an (equally flawless) ST-412 knocking around, but 10MB is a bit on the low side, and more relevantly it takes up both 5.25" external bays - so no Seagate for this little system for now. I got the itch and found a 384MB RAM expansion card and ordered it this afternoon, if only to have a single 16b card in the system. But this evening I fast-forwarded 10 years to the mid 1990s. I've been planning a multi-sound-card setup for a while now and have a suitable So7 board with lots of ISA (MS-5122 SiS 5511-based board with 3x PCI, 4x ISA). Slapped a P133 and 64MB of EDO into that, added my Diamond Stealth3D 3000 (Virge/VX) card and then started on the sound cards. My big issue with Creative is that I want to use an 8GB SSD with a single partition, so I need FAT32, so I need MSDOS 7.1. Which means that CTCU/CTCM refuse to work. I've found a workaround using SETVER 6.22 and the /T flag for CTCM, but CTCU still just refuses to run. So sod that - I have a non-PnP CT2910 I'll use instead (and a nice pile of Roland stuff for MIDI, so lacking AWE isn't too terrible), but that's for later on. CelGen wrote: All I'm missing now is the proprietary mouse that plugs into the keyboard so I don't need to use up an ISA slot or my only serial port. Starting with Windows 1.03 the environment shipped with native support for said mouse and the high resolution video mode. I hope you find that mouse. Wow..This system (your AT&T) is an absolute beauty! Nice job. It's basically a Logitech BUS mouse with the D-sub connector instead of Mini-DIN. I got a bunch of BUS mice already but none with the D-sub connector. Haven't done much retro activity lately. Was on holiday so my Hackintosh Doom 3 gaming was put on hold for a while and then when I got back I had to repair a 2015/2016 Win 8.1 Intel Atom Tablet that suffered a broken screen, followed by setting up a 2013/2014 Core i7 PC to replace my aging Core 2 Quad Q6600 as my main day-to-day machine. I built the i7 for a friend about 5 years ago and they've now built themselves a new PC to replace it, so I bought the old one back at quite a steal. So really the only "old" PC I've been working on lately is my now-retired Socket 775 Core 2 Quad system. Basically wiping the OS and re-setting it all back up for use as the new "Family" PC, replacing their Athlon 64 X2 5200+ system. They're not going to get much of a speed increase for what they use it for, but certainly an improvement and I can use the old AMD system as a backup HTPC.